Found 2 file extension associations related to Myst 3 Exile and 2 file formats developed specifically for use with Myst 3 Exile. The all-new sequel to Myst® and Riven™ has new technology, a new story, and a new archenemy. It's the perfect place to plan revenge. The success of Myst continues with five entirely new ages to explore and a dramatic new story line that features a pivotal new character. Free-look movement system allows players a full 360-degree view from any location. Puzzles gradually reveal mystery and intrigue as they are solved. Dramatic new storyline introduces a new villain. Rich music and riveting cinematics create a lush and immersive environment. 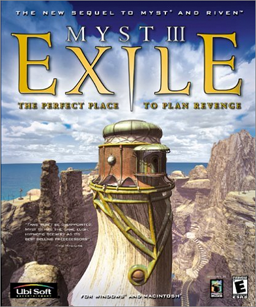 If you need more information please contact the developers of Myst 3 Exile (Ubisoft Entertainment S.A.), or check out their product website.